find the funds that they need. * WOULD YOU LIKE TO WORK SMARTER....? .....NOT HARDER? GOOD BOOKS MAKE US THINK....GREAT BOOKS HELP IMPROVE LIVES. Do you desire to help needy people or improve the schools? WANT TO RAISE FUNDS AND HELP A GOOD CAUSE? * This is not an MLM deal; not a gifting plan. LET US SHOW YOU HOW TO EARN BY MAKING REFERRALS ! * NO HUGE UPFRONT INVESTMENTS REQUIRED. * NO NEED TO BUY A BIG INVENTORY. * NO EXPENSIVE 'SIGN UP'FEES...NO KITS TO BUY. * NO DOWNLINES TO BUILD OR LONG TRAINING MEETINGS. Want to reward your students or athletes ? Want to support and promote education? Want to raise some funds? --positive messages and words of wisdom! representative of a 'success guru' who is featured in our books. 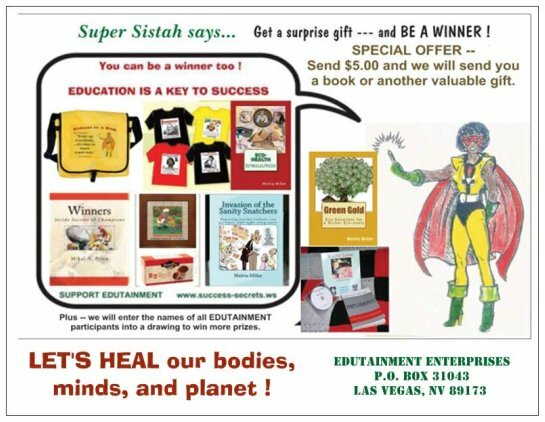 SUPER SISTAH advocates education and good healthy values. YOU CAN HAVE A MILLION DOLLAR DAY ! Click here for info on getting INCOME INFO online. If you want to HELP SAVE THE PLANET, contact us. 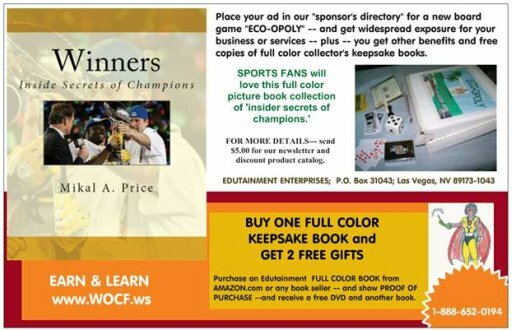 simply making referrals of sales to WOCF. Click here to SHOP at our BOOKSTORE & GIFT SHOP online. WOULD YOU LIKE TO HELP SUPPORT IMPROVEMENTS IN EDUCATION? is easy and fun --- plus educational. Click here to get more info on PROMOTING YOUR SERVICES online.